Last Mountain Lake in Rowan's Ravine Provincial Park in the Qu'Appelle Valley, Saskatchewan is a beautiful location to spend the summer holidays. This couple has come fully prepared with an umbrella, coolers, chairs and a boat parked nearby to fully enjoy their holidays. Spanning a length of 70 kilometers, Last Mountain Lake has plenty of surface area for boaters, water skiers, sail enthusiasts, fishermen and swimmers as well as all the other fun summer activities. The beach at Last Mountain Lake is made up of natural sand making it ideal for beach volleyball, frisbee or walking barefoot along the shores of the lake. Last Mountain Lake is geared towards families who want to enjoy all the luxuries of holidays in one location. 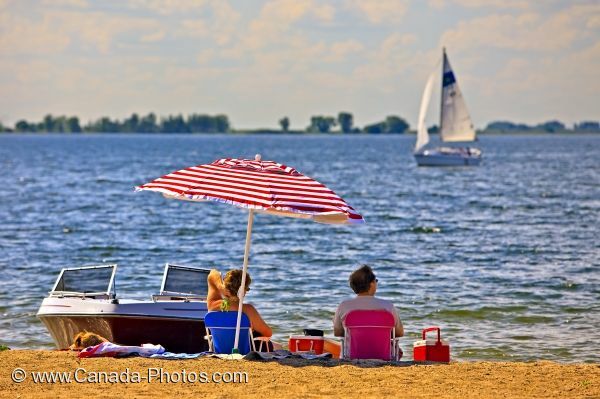 Picture of a couple enjoying a beautiful summer day while on holidays at Last Mountain Lake in Saskatchewan, Canada.